Macros can be used in order to create a naming convention and to group your documents. If a user needs to name their invoices after the Vendor name and the invoice number, they must use macros. Macros work the same way for PDF, TIFF, XML and CSV. Macros can be activated from the Settings of each type of local export. More than one macro can be used at one time. The user can hover over the path expression text box and a pop up will appear explaining the macros and also explaining how to manipulate date and time strings. Some macros can also be used in the Field designer as formulas in order to display relevant data into a field. For example, the path to the document or the user ID of the currently logged user. $(Env-USERNAME) – displays the user ID of the currently logged user. $(ExportFolder-PDF) – displays the default export folder for the format mentioned in the macro. Can be manually changed to XML, CSV and TIFF. $(FileModified-yyyy-MM-dd hh:mm:ss) - displays when the file has been modified in the following format: year, month, date, hours, minutes, seconds. 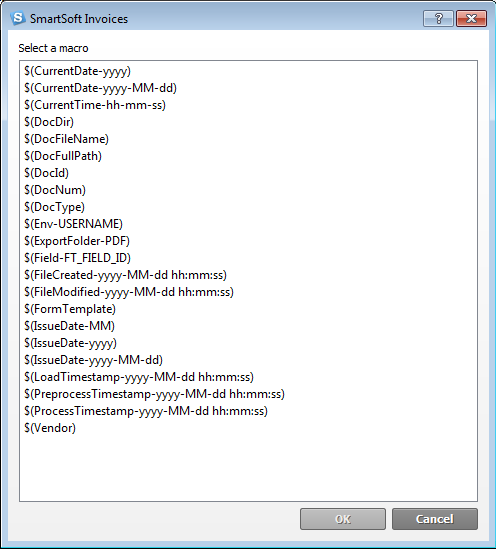 $(IssueDate-yyyy-MM-dd) – displays the issue date of the document. The date format can be manually manipulated.